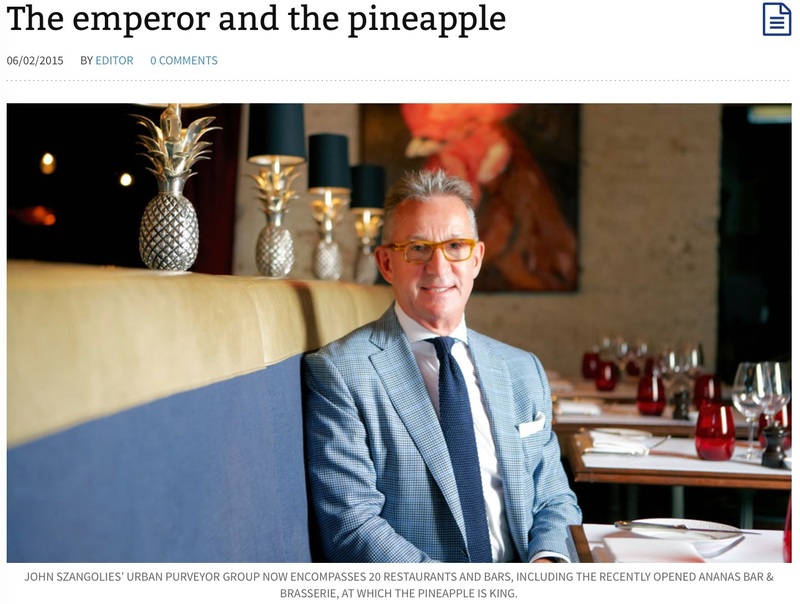 It has been a long and challenging, but ultimately immensely rewarding, road for Urban Purveyor Group’s founder John Szangolies. Along the way he has sidestepped his fair share of obstacles and made a lot of fine and timely decisions. Chris Sheedy seeks out the secrets to his success. In the incredibly sassy and deliciously designed confines of Ananas Bar & Brasserie in Sydney’s The Rocks district, it is an experience in itself just wandering through the space and appreciating the decor. Before you are even seated, the room’s atmosphere makes it clear that guests are in for a very special evening. There is an elaborate table that was rescued from a theatre in Paris. A clock on the wall, various antique sideboards and pineapple light fittings came from antique stores in the French capital. And the zinc bar top was designed and hand-crafted in the City of Light—the French master craftsmen travelled to Sydney to weld the final pieces together and ensure they were a perfect fit.